Hillside Cottage is in an elevated position with superb views, six minutes walk down to the town centre. It is the end cottage of a terrace of three in a quiet sunny location. 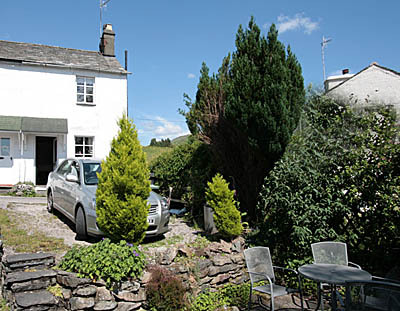 There is parking for one car and a small garden with outdoor furniture for al fresco eating. The views are to the south across the town and north on to the fells towards the Kirkstone Pass. The ground floor is an open plan lounge/kitchen/dining area. The lounge area is cosy and comfortably furnished, with tasteful ornaments, TV, DVD, wi-fi and stereo unit. In addition to the central heating, there is a living flame gas fire. The kitchen/dining area is modern and extremely well equipped with everything you’ll need for self catering. There is a fridge freezer, washing machine, electric oven and hobs, also a microwave. Weekly rates are £290-565 according to season. Changeover day is Saturday. Rates include freshly laundered bedding and all utilities. The house is totally non smoking and we regret no pets. For more information and for bookings, please go to our WEBSITE or email:morrisgordon@rocketmail.com, or phone 07747 794790.